Anne-Marie McIntyre’s ceramics are part of an ongoing experiment in bringing her drawn line into the physical world. The unusual techniques found in her work have been developed over years of studio practice. These include an extensive repertoire of hand mixed glazes, drawing with clay slip and wax resist and combining elements in multiple firings. 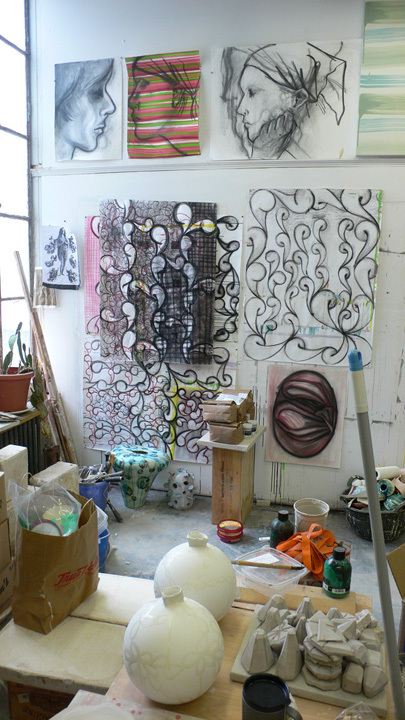 Her ceramics are done in conjunction with her drawings and both are based in material exploration. Anne-Marie McIntyre is an artist and educator who maintains a studio in Dobbs Ferry NY. She received her BFA From The Cooper Union and her MFA from Tyler School of Art. She has taught ceramics at Greenwich House Pottery and SUNY Purchase, and most recently has been a resident teaching artist with The Hudson River Museum, Studio in a School and The Cooper Union Summer Intensive.